I should be embarrassed that I watch other people play video games every night before going to sleep. But I’m not. I think what I’ve learned from the gamer community in the past couple of years is a model for how society overall should behave, connect and return to giving a crap about each other. Before I tell you my story, I want to set your expectations: this is not some article with best practices or case studies. I am not promoting a brand or a methodology. I am writing about something that truly touched me, and has forever inspired me. It was a typical night at the end of April when I logged in to Twitch.tv to watch my favorite video game streamers play my favorite game. Something was off. The streamers were quiet. Sullen. I switched to watch other streamers, and it was the same everywhere. Wow. Going on Twitter to say you are signing your own DNR. It broke my heart. Back at Twitch, through choked back tears and sadness, they rallied to his side. They updated “chat” (as they call us video voyeurs) with updates to his health, often sending us to other streams to learn more. People started preempting their own streams to play greatest hits and hilarious moments from Allied. They did everything they could to encourage, calm, and share. But unlike other social networks, they did more than that. Throughout the night, hashtags appeared. A website popped up selling #AlliedStrong t-shirts. 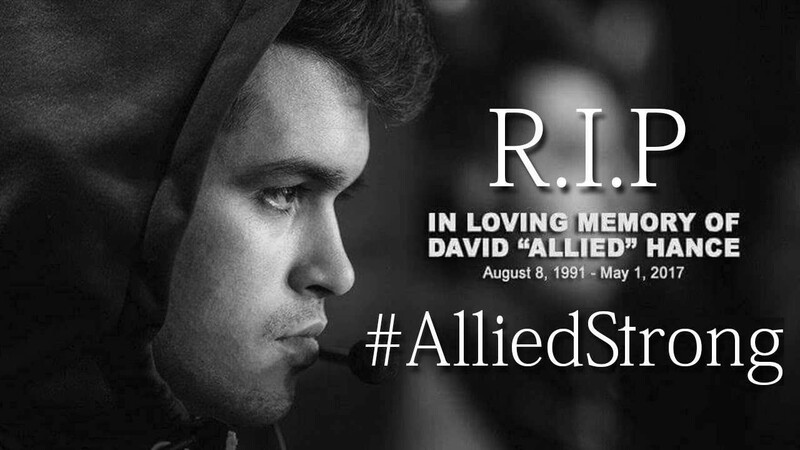 Streamers who collect donations and subscription money from their followers started giving to Allied’s family to help with his bills. And by the next morning when he tragically passed away, and the day of mourning followed, over $120,000 was raised (from what I could uncover). In two days. No marketing, no ads, no sales calls, no infrastructure — just a community supporting their own. A community of friends, sure, but also of strangers. Of people like me who had never heard his name before that awful night who was so affected by this outpouring that I donated $50 as well. You should learn about Twitch. These streamers are equal parts charisma, intelligence and motivational speaker. Often vulgar, frequently egomaniacal. If you tune in for 10 minutes, you won’t get it. There’s lots of swearing, lots of insults, lots of sexism and shocking outbursts. But if you stick around, you meet their dogs, their girlfriends and boyfriends, their favorite viewers, and their passions. When Drybear and Li’l Mamacita started dating and moved in together in Atlanta near the headquarters of Hirez Studios, we got to see two personalities — celebrities to me — in an unproduced, unintended reality show. You get attached. You root for them. You experience their victories and defeats right from their bedrooms. You watch them build their followings from their skill and their charm. Getting sponsors. Getting recruited as community leaders for game publishers. Making up to $2.5 million dollars a year (reported for one legendary lady streamer) from subscribers giving them $5 dollars a month and tipping them for just being awesome. Or buying a $4.5 million home in Hollywood. Sure, some are living in their parents’ homes. But some are doing so while they get PhD’s. Some are mastering their bodies — in fact I follow DJ Pernicus, a Ryan Gosling lookalike medical student, on one hand, and Barefoot Treadmill Gamer, on the other, who knows he needs to shed a few pounds and is setting an example for his audience by gaming while he walks. They meet each other around the world in championship games where the purses for prizes, raised by big-name corporate sponsors, game studios and the community itself exceed tens of millions of dollars up-for-grab. The secret to success? Great chemistry, teamwork, and communication. Great chemistry, teamwork, and communication produced a game-bundling product strategy that is a standout in the world of gamers supporting causes. If you dig deep, it’s not just the discounts that fuel revenues for Humble Bundle — it’s their mission. They give 20% of proceeds to charities they select and change based on need. Their customers know this. And because, unlike so many other tranches of our society, these gamer customers care about something bigger than themselves, they often pay more to give back. They gladly contribute to other communities — ones they don’t know will be there for them when they are in need, as their own is. But still they buy. And have raised $118,000,000 along the way. What if you decided that this community was more than just a money-making machine? What if you were part of this community so much, and believed in its members so much, that your personal mission was to manifest good around the world, getting gamers to simply give of their time and their influence to support causes? A Belgian gamer, Bachir Boumaaza, did just that. Known as Athene in the gaming community, he wanted to expand his reach farther than his own YouTube channels to raise money for charity. He had some track record. He once offered his 750,000 followers the opportunity to request that he shave parts of his head if they made a donation to charity. By the time he was totally bald, he had raised $180,000. Boumaaza created a platform for gamers called GamingForGood.net, and has contacted thousands of gamers, asking them to join him. The platform allows fans who send money to request that streamers donate a specific portion to charity. As of the date of this publication, Gaming for Good has raised almost $24 million for Save the Children. In writing this article, I learned a new term: “citizen scientists.” Apparently, it’s a thing. It follows along with recent trends in civic engagement from groups I am affiliated with like Every Voice Engaged Foundation. But that’s another story. Imagine that the limited staff of a hospital must analyze tissue samples under a microscope in order to define a treatment path for cancer patients. The process, as I read it, is painstakingly time-consuming, and lacks any kind of peer review for results. Which would take even more time. And that’s one thing that cancer patients don’t have: time. Now imagine digitizing 2.5 million samples and making a mobile video game out of their analysis. As gamers review samples and peer gamers draw the same conclusions, the sample size of gamers turned citizen scientists is large enough to generate validated peer review. Sound like sci-fi? I’m not trying to get you to become a gamer. Don’t worry. But no matter what you think of gamers, the power of this community and of the games themselves (as medical therapy, for example) seems to be only now being realized. And not just for war, like movies from the 80’s would have you believe, but for doing massive amounts of good, quickly and efficiently. I work to raise money for non-profits in an agency called Matchfire, and I can tell you, getting people to swarm around a cause to raise even a modest amount of money is hard work. It takes great expertise, loads of experience, some trial-and-error, and a hope that your cause rises above the others competing for the same attention. We shouldn’t have to struggle to get a few cents donated at a cash register. I wonder why, if gamers can rally to raise hundreds of thousands or millions on behalf of something they care about in hours or days, what it is that we can all learn from that. What I’ve come to believe is that these people I watch each night are special. But they shouldn’t be. The rest of us should be special in the same ways they are. Maybe not as vulgar or aggressively competitive, but certainly as invested in our lives, the lives of others, and of those we’re only loosely connected to. I think this is what living in a community is. I think this is what our society of disconnected communities needs right now. I started this article saying I have been forever inspired by this experience. And I hope that even if the gamer community isn’t your thing, it inspires you to look around a bit more. See people a bit differently. And care a bit more about making a difference in each others’ lives. See you in chat.